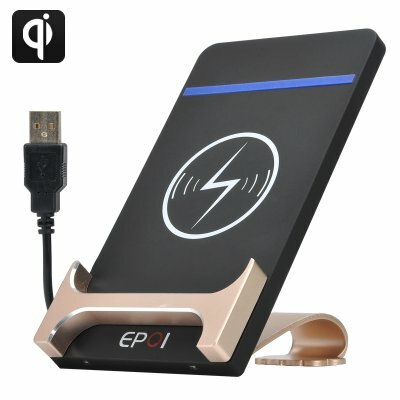 Successfully Added Qi Wireless Charging Pad + Phone Stand - 1Amp, 5Volt, 100 To 205 kHz Frequency, WPC/QI 1.1.2 Compliant to your Shopping Cart. This Qi wireless charger for phones and phone cases has a metallic stand that holds it in an upright position so as you can charge your phone yet keep the screen in plain view. It uses electromagnetic induction to recharge compatible devices without the need for cables. Simply places your Qi phone on this phone stand and it will recharge with 5 volts of power at 1 amp without needing to connect anything to your phone. It’s just as efficient as most USB charging plugs and a lot more convenient as you won’t need to plug and unplug your phone each time. Saving lots of wear on the USB port and meaning you can pick up your phone to take a call without needing to unplug it first. Qi wireless technology is already on many hundreds of devices and brings the simplest fast charging fo busy people. It has a growing presence in big businesses and passenger hubs including many major airports, where its streamlined service means users can benefit from secure quick charging with minimal effort. Supporting a range of phones from major manufactures including Apple, Google, HTC, Nokia, Motorola, Samsung, Sony and many more this growing technology is the future of easy charging and helps keeps your phone safe and secure as well. This stylish Qi wireless charging pad and phone stand comes with 12 months warranty, Brought to you by the leader in electronic devices as well as wholesale Phone accessories..